what I get is not the usual banners but instead, it leads me to a different panel. Google Referrals allow you to choose specific products or groups of products to advertise on your site, allowing you to match ads to your content. Choose up to 15 products or specific ads to rotate in the referral unit. 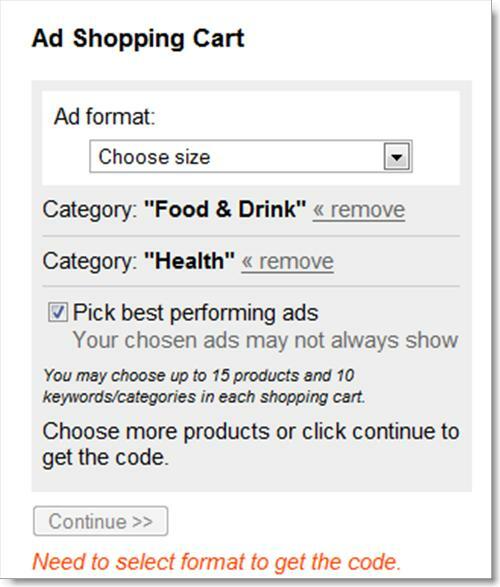 You can also choose categories and keywords to ensure you get newer ads as they become available. I selected Malaysia > English, ie Adsense in English for ads targetting Malaysia in the categories of Food + Health + Travel. So, far the ads appearing on Best Recipes are almost what I selected. I hope to see a better [tag]Google Adsense[/tag] income from this selection. Anyway, my Best Recipes site has fetched me very decent income as it rules in several good keywords. Monthly, I get about RM500 from the site alone, just from Adsense. So, do you think writing a recipe and food site pays? Of course! I don’t have that panel on my dashboard. Wondering whether yours is specially selected for this feature. pablo – Really? I also don’t know. I only notice it today. Wuah, maybe I am preferred publisher leh? Hahaha. I read your clarification in your follow up post to this. Thanks!